Patchwork & quilting represent age-old techniques, usually born from thrift and poverty. The earliest quilts were usually made from old clothing; cut up, sewn back together, backed with a (probably old) blanket for warmth and densely hand stitched together. These days, functional quilts are still made as practical items, often as gifts to celebrate a marriage or the arrival of a child. The cloth used is often commercial but more and more makers are turning to dyeing their own fabric. Modern inventions include ‘wadding’ or ‘batting’ made from cotton, wool, silk or a synthetic fibre which forms a warm mid-layer, and a backing fabric creates the triple sandwich. Whilst some quilts are still hand stitched together, many makers now opt for the speed and convenience of the sewing machine and this has seen the growth of ‘long arm’ quilting machines. I re-ignited my textile journey with quilt making, so quilts will always hold a special place for me, even though I now only make ‘funky functionals’ for grandchildren and friends. For art that uses quilts as the medium, I’ve chosen three artists whom I admire and who are all very different. Crow is an inspiration to many people, being completely dedicated to making art whilst still managing to find time to bring up a family, teach, build a world-class facility, curate exhibitions and travel to places with a strong textile heritage. She is fierce about what she wants to say about making art so I‘ve chosen to use her own words. The premise for the ‘Drawings’ shown here is just that; “drawing, my type of drawing, drawing in fabric. I also wanted to highlight patterning that feels very close to my soul. And who can explain why the soul responds to what type of patterning? In Drawing: Riff 5, my drawing began tightly, too tightly, almost classical in sensibility. But as I continued, my cutting (drawing) slowly loosened up”. Of ‘Riff 7 and 8, Nancy says “I began to examine colour relationships while the drawing itself became looser naturally”. Apart from a body of work made using a mono printing process (which she plans to continue exploring), all of Crow’s quilts are machine-pieced from fabric structures she creates, which she calls her ‘vocabulary’. She cuts and sews three to four times more than finally used in any composition as she needs a large vocabulary to work from in order to proceed freely. “When I work on a quilt, I put away all thoughts that are not helpful and channel my energies towards relaxing and becoming one with my fabrics. Never, ever do I think about what others expect or want or what will sell, but rather I look at my time in my studio as a process of discovery. I love being inside my brain and pushing myself to think in ever more complex ways because I know the ideas are there for the taking. It’s all about being focused and disciplined and making use of one’s abilities. And about being alone, in solitude, so one can think and feel deeply without interruption. I have definitely grown far closer to myself rather than to others because I see my quilt-making as my experience which has nothing to do with other people”. I identify who I am with my artwork ... in other words, I love the work, the experience of making each quilt. It’s my life, my life’s work! I feel lost not doing art, unsatisfied, anxious, bored”. I think we can all identify how frustrating it can be if we can’t get to work. 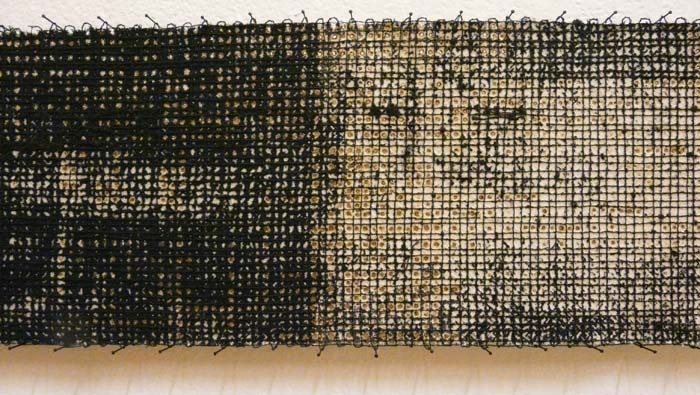 Pauline Burbidge has long been an inspiration to British textile artists. Her inspirations are “a love of the rural landscape, the natural world and the spirituality of a special place” . Pauline describes how – at the age of 25 - she was moved when viewing an exhibition of antique quilts. Coupling this passion for cloth, stitching and making with her art school practice of drawing, colour, line, and abstraction has meant that she remains one of the foremost artists working with textiles today. In the early days, Burbidge focused on piecing together plain, dyed fabric to create her imagery. This came from the tradition of patchwork, but with the images or designs being wholly Pauline’s, often based on abstracted photographic images. Burbidge herself describes the early works as being “controlled, hard edged, geometric” , and in the mid 1980’s, she decided to “loosen up a bit“ and made paper collage studies to help her, which then led onto fabric collage, which she pursues today. She usually begins with a place of inspiration where she observes and absorbs; making drawings, taking photographs and collecting items such as leaves, grass etc. from the landscape. Being in the landscape will also often make her think about cloth; ripples in the sand could remind her of the texture of pleated cloth or the reflections in a river may look like shredded cloth. Like Dorothy Caldwell, on her return to the studio Burbidge surrounds herself with sketches, images and collected items and begins to make fabric samples that relate to the ‘collection’, using a variety of approaches. Burbidge continues to work in a free-form way with collage, stitch and quilting, sometimes ‘drawing’ with machine stitching, sometimes hand stitching. In addition to her Quiltscapes (quilts or textile hangings made as art), drawing with the machine led her to developing a range of functional quilts called Quiltlines , which are faster to make and therefore more affordable, which helps to broaden the audience and which has finally enabled her to make a living through her art. 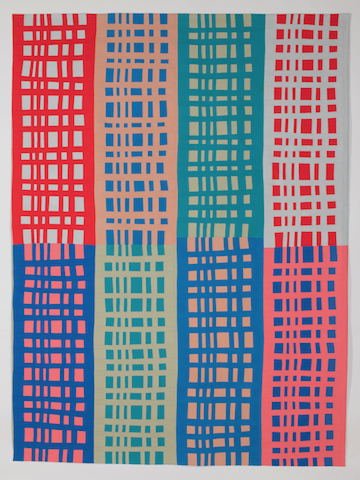 Harrison’s practice explores the tradition of quilting but goes beyond the functional or decorative, resulting in art textiles than can be exhibited and displayed individually or as part of a series. Each piece is focused on the tactile and visual qualities that result from dyeing, layering, stitching and bleached overprinting of cloth. Depending on the type of cloth used, these processes often result in shrinking, stretching and distortion with traces of stitching revealed through the discharging of the dyed ground. Harrison says of this “the cloth and thread become one”. Whilst the development of the cloth and continued engagement with textile practice is of obvious importance to the work, the content can be traced back to different sources. One source is travelling, specifically the repetition of a regular commute. This has given Harrison the time for thought and provided visual stimulation though the surface markings, curves and ‘distances’ of the road. Another series has been based on bone density as seen in x-rays of fine and fragile structures, where the thinning and wearing away is represented by stitching and bleaching resulting in lines criss-crossing, meshing and supporting. Piles of boxes put out for recycling have also provided thoughts about surface and structure, containment and emptiness. In Harrison’s most recent exhibition at the Festival of Quilts in 2017, ‘Traces in Cloth’ she uses and manipulates found items by unstitching previously sealed pillowcases or over-dyeing and bleaching into handkerchiefs. She works with the original measurements and cloth qualities, so boundaries are given and this defines the outcome. The format and history is still evident but transformed. Creating new surface ‘qualities’ on the cloth is of huge interest to Harrison and as a result, ideas develop through and from the material itself. In addition to dyeing and subsequent bleaching, she is also exploring using chemicals and heat to burn and destroy in order to achieve new surface qualities. Of her work, Harrison says “over time, my work has explored textiles from embroidery to quilting and to larger installation works, constantly questioning and discovering different ideas and processes. It is through a real understanding of craftsmanship and enquiry that my work continues to develop”. The next article will be a departure - just for a moment - from textiles. Instead, it’ll have a ‘travel’ feel as being lost in landscape feeds my practice. After this I’ll return to textiles, and begin to explore some specific regions, and the work I’ve made as a result of being in them.